The boys and I have been keeping busy over our winter break… We’ve done those bead things that you iron (pearler beads they might be called), we’ve baked, we’ve gotten haircuts, played outside and met some new friends! 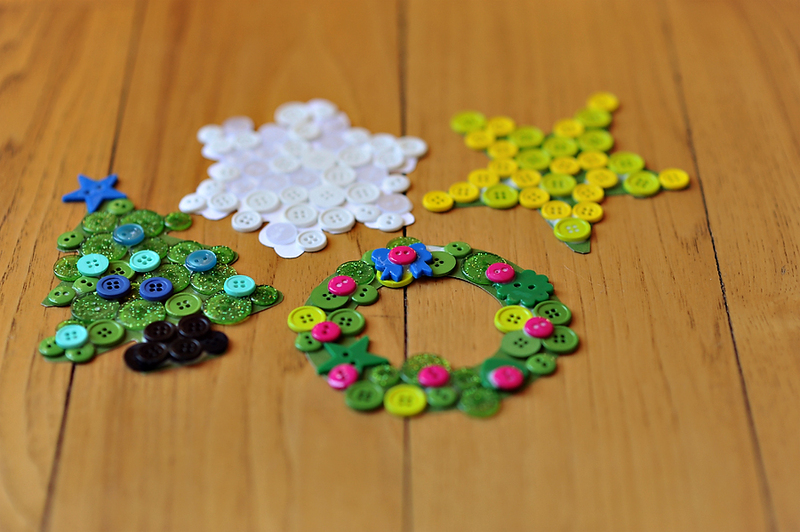 Today we made these cute little button ornaments. They didn’t take long, but they were fun! They might be a good thing to bring to Grandma’s or attach to the outside of a holiday gift! Here’s the skinny…. 1. Trace some of your favorite cookie cutters onto tag board. I tried to use tag that matched the color of the shape (white for the snowflake etc..) I free handed the wreath because the boys really wanted a wreath (go figure) and I don’t own a wreath cookie cutter! 3. Slather the front of your shape with all sorts of white school glue… For my boys, this was the BEST part! 4. 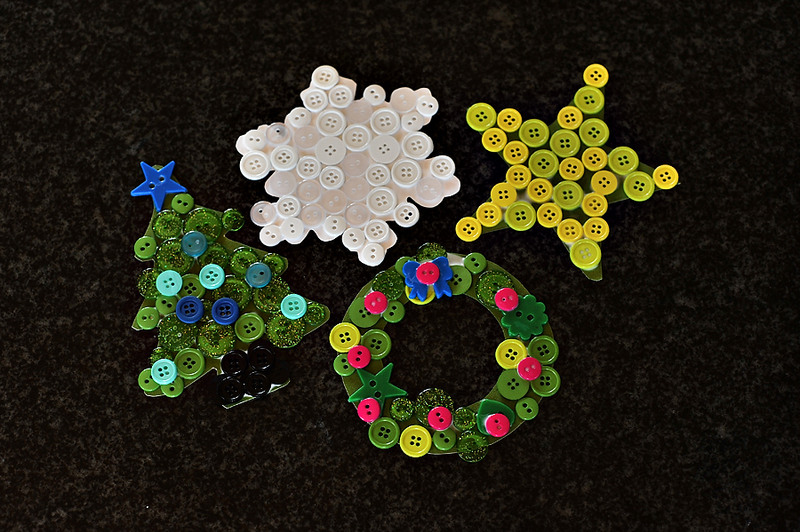 Stick buttons of all shapes and sizes all over your ornament. I did try to “sway” my kids towards choosing colors that are suited for the shape, but I also think making a bunch of trees in all different colors would be adorable. I actually think cutting just triangle trees (no branches) and then making all different colors would be fun, but my boys wanted different shapes! 5. We did a second layer of buttons on the tree for ornaments and on the wreath for the bow and berries… You can tell we took the pics a bit before the glue dried… I would recommend waiting to attach a clothes pin and/or magnet until they are completely dry. 6. VIOLA… Like I said, these would be super cute tied to a Christmas gift, as a gift for Granny, or just hanging on your tree! You could put your child’s picture inside the wreath-that would capture Papa’s heart! From our house to yours, Merry Christmas! We’re off to make some Candy Cane Ice Cream…. MMMMMMMMM!